The Whiteville City Council has identified economic development and jobs creation as its top goal for the city in the upcoming fiscal year. Their decision came in a two-hour workshop prior to their regular council session Tuesday. Cape Fear Council of Governments Executive Director Chris May facilitated a discussion in which council members also listed street improvements, enhanced parks and recreation programs, stormwater control and enhanced public safety through functionality improvements at the police and fire departments as other top priorities for the year. Other areas on which the city hopes to make progress during the fiscal year beginning July 1 include affordable housing, maintenance and repair of the water and sewer systems, pursuit of establishment of a long-term flood mitigation committee, making general “facelift” and beautification efforts, and spending where needed in order to keep up with ongoing improvements. Later, after the workshop and during their regular council meeting, the board approved a plan to place wireless internet downtown (see related story elsewhere in this issue), recognized a firefighter on his promotion within the department, approved an architect’s proposal for services in design and construction of the new ABC store, imposed new regulations on new trash dumpsters, lowered permit fees for remodeling projects and removed a member of the Whiteville Housing Authority board who has not attended meetings of that group. Fire engineer Donnie Coleman was promoted to first lieutenant within the department and Coleman’s dad, Danny Coleman, pinned insignia denoting his new rank onto his uniform as council members looked on. Fire Chief David Yergeau said that the decision to promote Coleman was difficult, because all four of the candidates had outstanding records with the department. 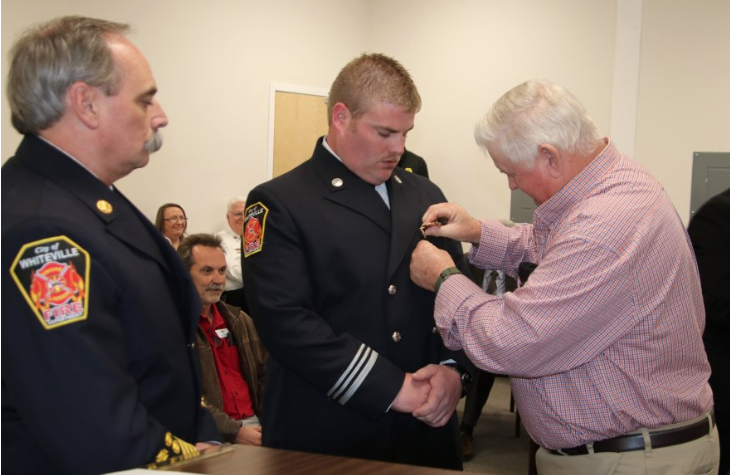 Donnie Coleman, center, has been promoted to lieutenant in the Whiteville Fire Department, and his dad, Danny, pinned his new insignia in ceremonies at Tuesday’s Whiteville City Council meeting as Fire Chief David Yergeau looked on. Council accepted a $98,500 proposal from Oakley Collier Architects of Rocky Mount for architectural services for the new ABC store. The firm also provided such services for construction of the new city hall. Services rendered will include conceptual planning and cost estimating, schematic design and development, creation of construction documents, coordinating the bid process for potential builders and construction administration. New trash dumpsters placed in the city after March 26 will need to be enclosed as a result of council’s passage Tuesday of a text amendment to the zoning ordinance. The ordinance, as proposed by the planning board, also would have given users of existing dumpsters a year to enclose their dumpsters, but that provision was stricken from the ordinance that passed. Council approved an adjustment in permit fees for residential remodeling. Under the new schedule, the fee would be $75 for up to 1,000-sq. ft projects with an additional 20 cents per square foot for larger projects. Tracy Morgan was removed as a member of the five-person Whiteville Housing Authority Board after council learned that she missed all five meetings of the body in 2018. She was a serving a term that expires on July 31. City staff will search for someone willing to serve in the vacant position, as well someone to fill another position on the board that has been vacant since October.